After the monumental, multi-billion dollar success that was Warner Bros.’ Harry Potter blockbuster film franchise, audiences and fans everywhere knew a spin-off must have waited in development during the age of the almighty dollar…And that movie is Fantastic Beasts and Where to Find Them, the first adventure following “magizoologist” Newt Scamander in his travels as he researches magical creatures for the subject of a book to better educate fellow wizards and witches. Fans of the book series will certainly appreciate Harry Potter author J.K. Rowling endeavoring on her first motion picture script with Fantastic Beasts, cementing the story in wizarding world canon. Loosely tied to the fictional encyclopedia Rowling wrote for charity as main character Scamander, the film takes place in 1926 New York and introduces the audience to the American equivalent of Harry Potter’s magical realm in England. Despite a few drawn-out sequences that affect pace, the cinematic return of Rowling’s incredibly popular franchise has plenty of twists, turns, and endearing, fascinating characters to please both lifelong fans and newcomers. Academy Award-winner Eddie Redmayne (The Theory of Everything, The Danish Girl) stars as Newt, an awkward, thoughtful, British wizard who arrives in America with a case full of magical creatures and a mission all his own. As Redmayne demonstrates in all of his performances, he again creates a character that only he can seem to portray. Like Hagrid in the Harry Potter books and movies, Newt has a particular fondness for the bizarre, frightening, and fantastic creatures the fictional wizarding world has to offer and wants to study them to help other magic folk appreciate them. A lonely and pet-loving sort, he even admits at one point in the film to identifying more with the titular beasts than other people. Helming his second film this year (another 3D studio blockbuster for that matter) after The Legend of Tarzan, director David Yates returns to direct his fifth entry in the greater wizarding world as he also led the final four movies in the Harry Potter franchise. Yates accomplishes the arduous task of establishing an older era in a world he already created without losing the setting’s familiarities. Tracking (following) shots to open the film intercut with panicked newspaper headlines containing moving photographs remind viewers of a similar beginning to Harry Potter and the Deathly Hallows—Part 2. Rowling and Yates visit familiar territory in regards to a few characters. As Newt arrives in New York, the viewer also learns that a dark wizard—Dumbledore’s old nemesis, Gellert Grindelwald—has begun a fanatical reign of terror, influencing people with magic to rise up and exterminate those who are without powers. Grindelwald and Voldemort share many unfortunate qualities and ideas which just feel like a road already traveled even if the characters have unique motivations. Ezra Miller (The Perks of Being a Wallflower, upcoming Justice League) plays Credence Barebone, a downtrodden, suffering orphan of magical heritage not unlike the Boy who Lived himself. Credence has many similarities to Harry Potter and leads the viewer to believe that Harry may have ended up in even worse circumstances had Hogwarts not come calling when it had. One theory poses Credence suffers the same illness as Dumbledore’s sister, Ariana. The writer and director also take the new franchise as an opportunity to depart from other rhythms established in the Harry Potter franchise. No longer following a group of children as they learn the ins and outs of magic, Fantastic Beasts instead focuses on a quartet of adults, three of which are fully-acquainted with spells, potions, curses, etc. In New York, Newt meets Tina, a disgraced American auror played by Katherine Waterston (Inherent Vice, Steve Jobs) who finds his unauthorized case of magical creatures as an opportunity to wedge her way back into the good graces of the American wizarding authority. Waterston gives a solid performance as the determined Tina, but the script does her no favors as a potential romance with Newt gets fast-tracked during the third act. 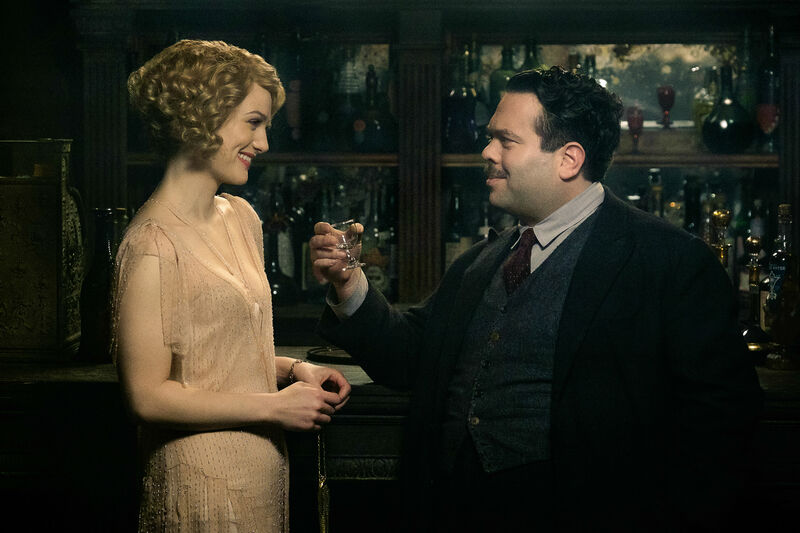 A likable war veteran and no-maj (American muggle) named Jacob, played by Dan Fogler (Take Me Home Tonight, Fanboys), gets mistakenly drawn into Newt’s adventure and becomes the audience’s vessel to learning about the American wizarding world. Singer/ songwriter Alison Sudol co-stars as Tina’s sister, Queenie, a young witch who has little difficulty reading thoughts. The film continues the franchise standard of top shelf talent and big, well-known names. As creatures pour out of Newt’s suitcase, the new heroes: Newt, Tina, Queenie, and Jacob must round them up and safely restore them as they avoid a rising threat in the “Second Salemers”—an organization set up to raise public awareness to the “evil” of magical people. These extremists appeal to the influence of a Newspaper magnate played by Oscar-winner Jon Voight (Midnight Cowboy, Superbabies: Baby Geniuses 2) and his senator son. As threats of no-maj action hit a peak, the rise of a dark wizard calling for their extermination appeals to fearful witches and wizards. One such suspicious wizard named Percival Graves appears in the form of Golden Globe-winner Colin Farrell (In Bruges, “True Detective”). Graves works in New York City as an intimidating auror, investigating a series of brutal, magic-based disasters around the metropolis while keeping close tabs on Credence, using the character as a twisted informant of sorts. In their return to the wizarding world, director David Yates and writer J.K. Rowling use the spinoff as an opportunity to expand and elaborate upon their dense universe. A well-known cast of award-winners in addition to impressive storytelling and spectacular visual effects elevate a film with a slow pace at times to begin a five-film franchise featuring the rise of another dark wizard decades before He-who-must-not-be-named. Fantastic Beasts and Where to Find Them will always draw comparisons to the Harry Potter series, and for better or worse, Yates will direct all five. If this new series hopes to surpass expectation or reach the same level of narrative quality, some new blood and more unique concepts must be introduced. It’s a shame that Alfonso Cuarón won’t get another crack at this playground. However, if the franchise continues the surprises introduced in its first entry, expect greater twists to come.